Hitz Fence offers the highest quality of maintenance free vinyl fencing, vinyl posts, porch rails, and so much more in Akron, PA. Not only are we a fence supplier, we're one of the top fencing installation companies in Akron. Hitz Fence Suppliers is your one stop fence supplier for maintenance free Vinyl Fencing, vinyl porch rails and posts, and all things fencing in Akron. 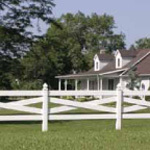 While we are well known as a fencing supplier, we also specialize in and offer fence installation in Akron, PA. 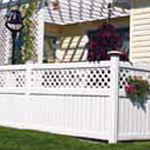 When it comes to our vinyl fencing or poly lumber, we offer a lifetime warranty that is non-prorated. We guarantee that our vinyl fencing will leave you with years happiness with your new fence in Akron. If you choose to do the fence installation yourself, we will ship you all of the parts needed after they are pre-fabricated for your fence in Akron. You don't need any special tools to install a fence from Hitz, providing you, the customer with a high quality, but easy to install fence is our top priority. If you're looking to upgrade or add to other aspects of your home in Akron, PA, we also sell and install decking lumber, vinyl porch and deck rails, and aluminum railings to compliment your new fence. We also sell and install decking lumber, vinyl porch and deck rails, and aluminum railings for any of your projects for fences or decks in Akron, PA.
No fencing or decking job in Akron, PA is too big or small for the team at Hitz! Why wait? Contact us for a FREE quote today!